A new exhibit at the Yale School of Architecture, Adjacencies uses a multi-media approach to tell the story of various strange and tactile projects from 14 emerging firms around the country, and the show highlights a one-of-a-kind, ground-up residential project that’s set to open in Atlanta later this fall. 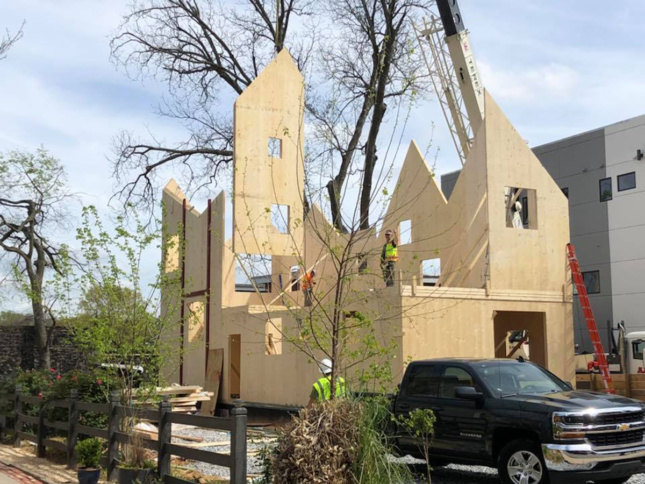 Haus Gables, designed by Jennifer Bonner of MALL, is a single-family home under construction along the Atlanta Beltline and a playful and surprising reinvestigation of the architectural zeitgeist using an exaggerated roof plan. 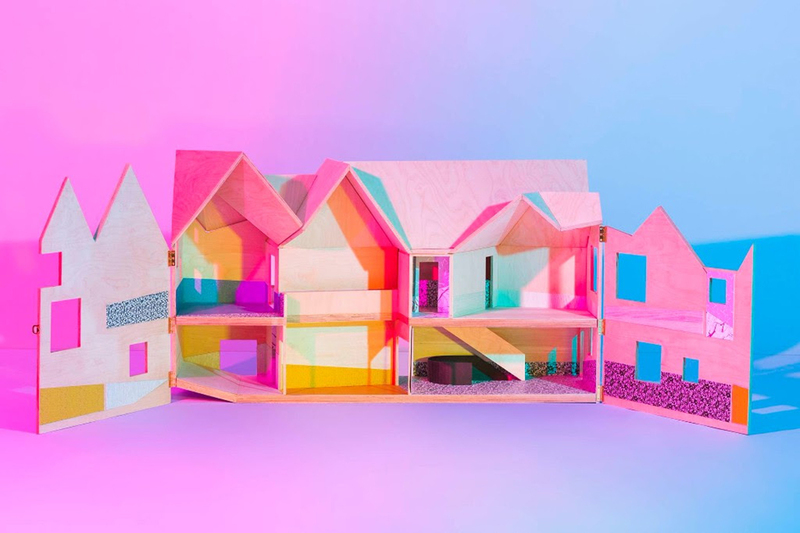 The house is broken down in detail at Yale through a series of bright models, drawings, and ephemera that unveil her design philosophy for this inspired and irregular building. According to the architect, the project was influenced by Le Corbusier’s free plan and Adolf Loos’s raumplan—both residential design methods that called for unconventional interior spacing. Bonner’s aim was to “rework the spatial paradigms of the past” by organizing her architecture solely around the roof. She designed Haus Gables, a 2,100-square-foot structure, with six gable roofs that form one elongated canopy. The unique shapes of the resulting ceilings produced an interior filled with oddly-sized rooms, catwalks, and double-height spaces that are confined to the steep ridges of the pitched roofs. The idea for Haus Gables formed out of a 2014 course she taught at Georgia Tech School of Architecture, according to an interview with Curbed Atlanta. 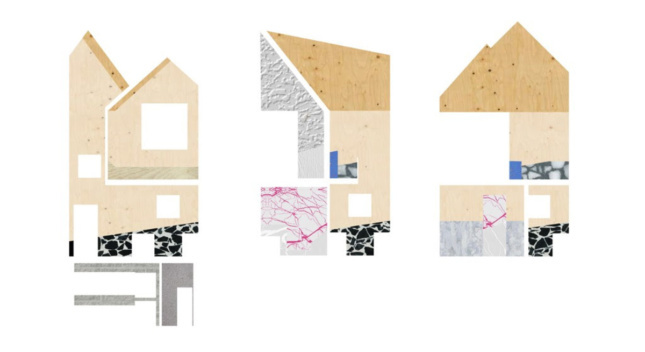 Bonner worked with students to imagine designs centered around individual architecture components. This exercise led Bonner to create her massive Domestic Hats exhibition for Atlanta’s Goat Farm Arts Center, for which she studied Atlanta’s various roof typologies and created 16 models with alternative roof forms that challenged traditional domestic design. While Adjacencies provides a behind-the-scenes look at how Bonner specifically conceived the Haus Gables project, the real-life version is nearly complete on an 18 foot-wide plot of land in Atlanta’s Old Fourth Ward. Not only is the design itself unusual, but so are the materials specified for the project. Most notably, it features a cross-laminated timber (CLT) structure, the second of its kind in the United States, and prefabricated components that were quickly put together on site over the last year. An inside look at the production of Haus Gables will be on view in Adjacencies, curated by Nate Hume, at the Yale Architecture Gallery through November 15. Bonner will give a gallery talk alongside the other featured designers this Thursday, September 13, at 6:30 p.m.